Oh, dont I wish it wish I didnt have to include a hyphen! I had a dream, but now that dream is gone from me. Yes, four more years of Robbie Findley. The guy whose claim to fame is one beautiful pass in his entire time in a USMNT shirt. In a friendly. Against Turkey. Im sure you can Youtube it. Just search under "the only thing Robbie Findley has ever done". We remember, Bob, how you selected him over any other striker you could have had (Casey...Ching...) and even played him over Herculez Gomez and Edson Buddle (who were two of the most in-form strikers on that squad at the time). We Rapids fans recall cringing whenever we saw his name pop up on the screen. Maybe a little bit because you left the man whose two goals qualified us for the World Cup at home. Thats right, the man who snubbed Denvers own Conor Casey, and instead signed up Robbie Findley is in charge for another 4 years. 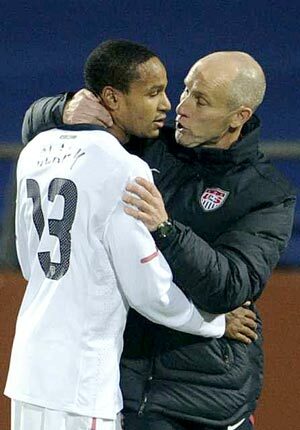 So no, Im not happy about this re-signing by Bob Bradley. Because, Robbie Findley. And who could forget this disaster? Delicious. Four more years of this. I support the US Team. Absolutely. But we deserved better than 4 more years of Bob Bradley. We deserved to take another step in US Soccer history. Yes, we got farther and performed better than before, but weve got to capitalize on that growth, not simply (at BEST) repeat it.